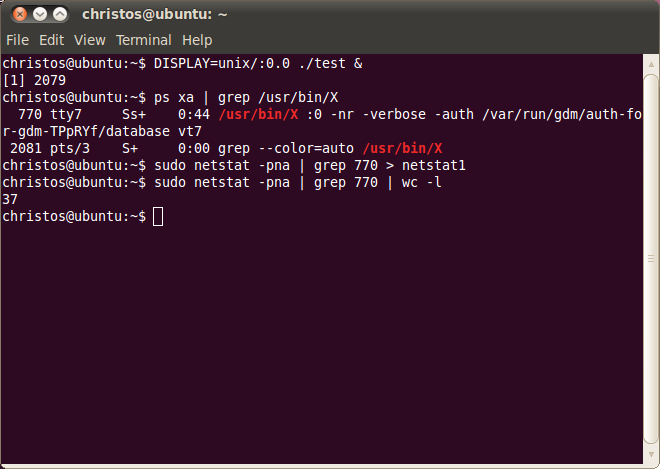 To find the process id of the X Server in our example we use the ps command, which returns 770. For the client we find the process id (pid) instantly when we use the ampersand ('&') character to run test to the background. This is 2079. 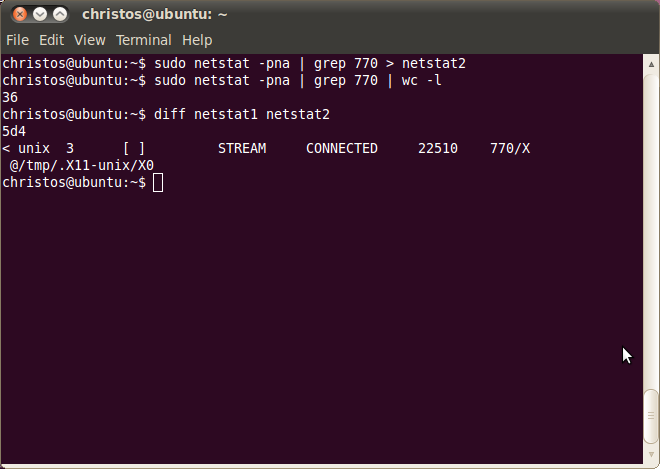 Next we use the netstat command to find info sockets in the system. Using a pipeline ('|') we pass the output to the 'grep' command to show only the sockets of the process with pid 770, which is currently the X Server. At the first netstat of the following image we use redirect ('>') the pass the output to file netstat1 and with the second we use a pipeline to count the number of lines the output gave. This is 37. From all UNIX socket with /tmp/.X11-unix/X0 path we especially should notice the third, the one with the larger (and possibly newer) inode number, 22510. This is the one as we show next that is used by connection of test, the X client. This is the time to find the socket info of the test part, where we find the inode number 22509, which is one number before 22510 of the X Server socket. This shows that the X client and the X Server created their sockets about the same time, which is what we would expect. The X Client is killed then, using the 'kill' command. We repeat the previous steps to find the number of active sockets of the X Server, now that the X Client is absent. 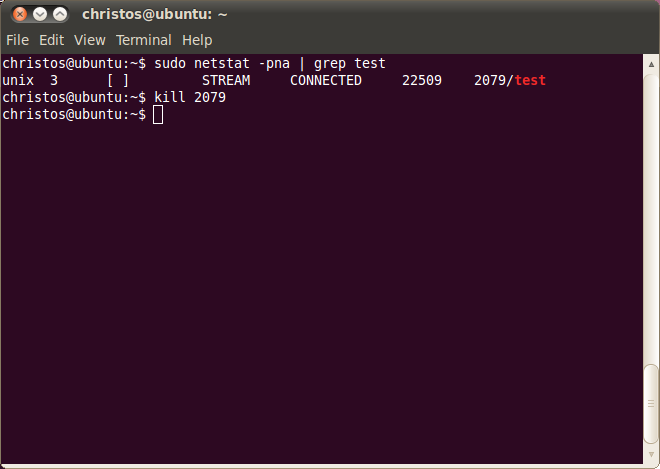 The number of output is now 36, which is one less since test was previously terminated. Also the new output of netstat is passed to file netstat2 in order to make the comparison between netstat1 (which includes test) with netstat2. To do so we use the 'diff' instruction, which shows that the socket with inode 22510 is missing at netstat2, as we expected. To have a look at the new output of netstat we run it without redirecting the output to netstat2. As we read in the netstat man page argument -n show numerical addresses instead of trying to determine symbolic host, port or user names. Also -a show both listening and non-listening sockets. Finally -A provides inet as the address family of the connection, therefore no Unix Domain sockets are included in the output. The first socket represents the X Server's listening address for new client connections. As we see under the 'State' header the sockets state is obviously LISTENING. The IP 0.0.0.0, which is bound with port 6000, corresponds to the IP address INADDR_ANY, which as we saw in section 1.4.2 represents any local IP address of the host. The socket at the fourth line after the header has at its Local Address the tcp/ip socket 192.168.1.101:51835. This is the socket of our X Client, which has an IP 192.168.1.101 and a port number 51838 and is connected (state is ESTABLISHED) with the X Server, which uses the socket 192.168.1.101:6000, with the well known port number 6000. If the conclusion that this is indeed our X client seems flimsy we have to proceed to the next to this figure, which verifies this hypothesis. Most of the times in the tcp/ip communication the client and the server are in different hosts and therefore the IP numbers are different. 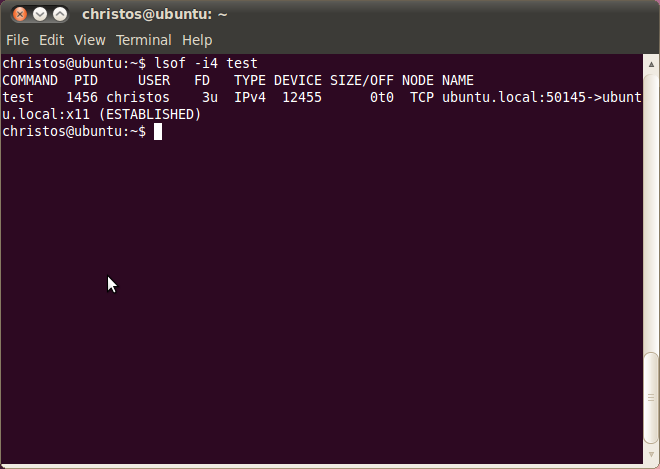 This is not the case however in this example, since we use the same Linux box for both client and server. The next socket found at the fifth line has also a port number 6000 at the local address side. Therefore it represents the X Server side. However we should not pay any special attention since the socket state is TIME_WAIT and as we will explain next this is a socket at its final stage, just before closed and it is the remnant of another similar with the current experiment of a connection that after some seconds no longer exists. The final socket with port number 6000 also in the ESTABLISHED state represents the X Server of our connection since in the Local Address header is found the socket 192.168.1.101:6000.
where the --inet is similar to -A inet and the -p argument show the PID and name of the program to which each socket belongs. This is 1421 and certainly the same as the one returned in the previous figure when we started ./test. This leaves no doubt that this socket belongs to our X Client. The absence of argument -n in the current and in the previous image makes netstat to try to determine symbolic host, port or user names. Therefore instead of 192.168.1.101:6000 the X Server's port appears as ubuntu.local:x11 and the X client's port instead of 192.168.1.101:51835 appears as ubuntu.local:51835. 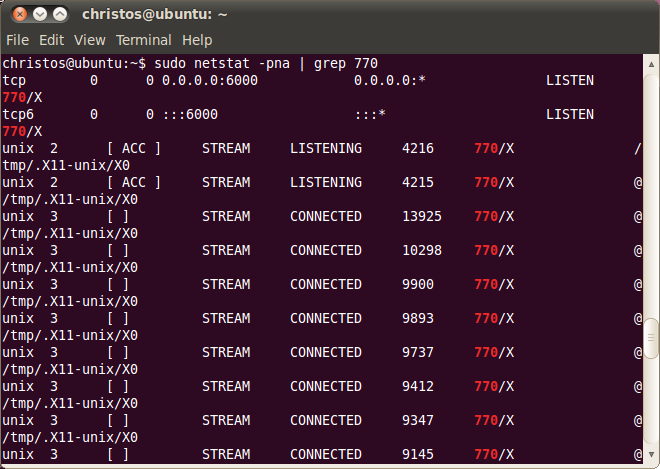 The domain name in our system is ubuntu.local and x11 is defined in /etc/services as the port number 6000. "The end that sends the first FIN goes into the TIME_WAIT state, because that is the end that sends the final ACK. If the other end's FIN is lost, or if the final ACK is lost, having the end that sends the first FIN maintain state about the connection guarantees that it has enough information to retransmit the final ACK." Also see the diagram in this link. "RFC 793 [Postel 1981] specifies the MSL as 2 minutes. Common implementation values, however, are 30 seconds, 1 minute and 2 minutes." "The reason that the duration of the TIME_WAIT state is 2*MSL is that the maximum amount of time a packet can wander around a network is assumed to be MSL seconds. The factor of 2 is for the round-trip. The recommended value for MSL is 120 seconds, but Berkeley-derived implementations normally use 30 seconds instead. ", where MSL stands for Maximum Segment Lifetime. On the whole issue of TIME_WAIT see also TIME_WAIT and "port reuse". Another interesting utility, strace, is used in section 1.5 to x-ray the socket system calls (socket, setsockopt, e.t.c.) of test.